View automated results analysis in real time. Store your data and share results with the team. See performance trends. 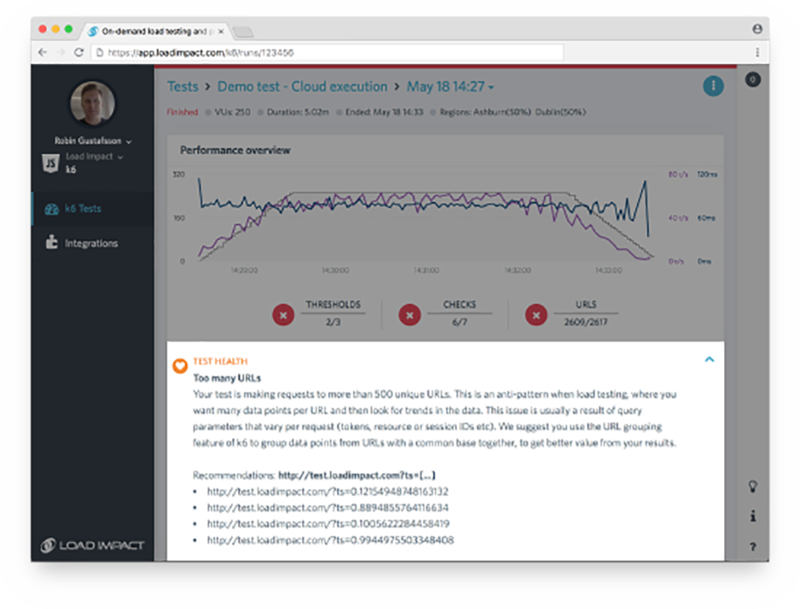 Performance Alerts help you quickly pinpoint performance issues in your target system, or problems with your tests. 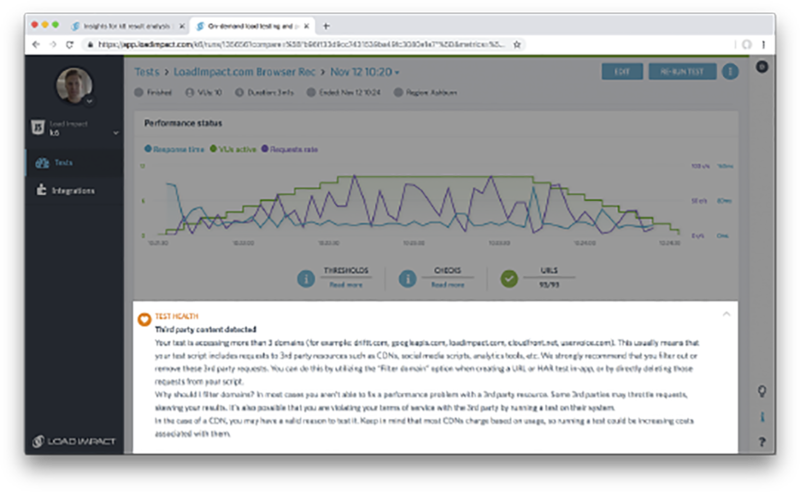 Your test results are automatically analyzed when you stream your results to LoadImpact Insights or execute your test in the LoadImpact SaaS application. 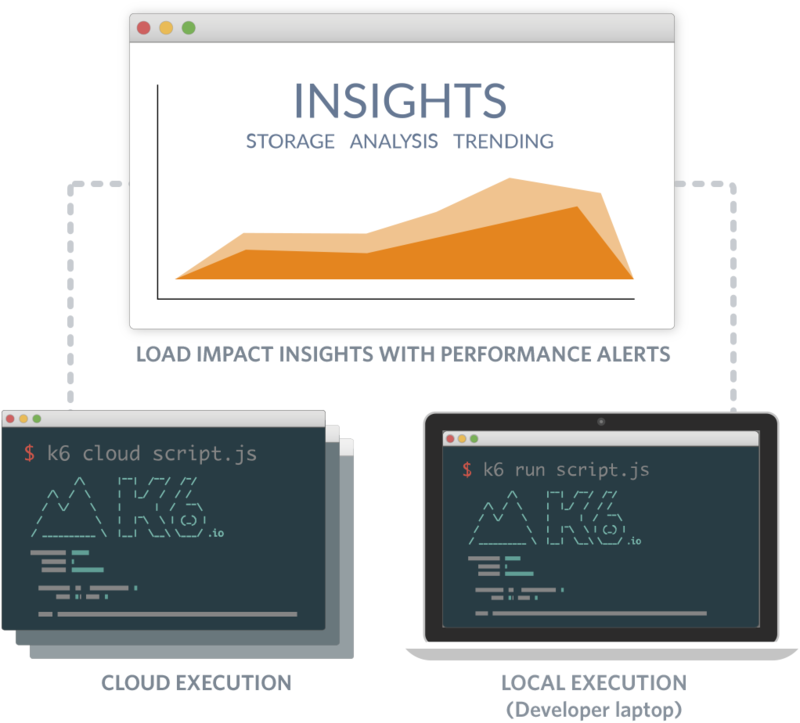 (Learn more about Cloud Execution). Smart Result Performance Alerts analyze your performance test results and alert you to performance issues in the system under test. Your target system (website, web app, API) has hit a throughput limit, meaning the request rate has flatlined. Your system is overloaded. The HTTP error rate for some period during the load test is at least 10% higher than in the beginning of the test. It usually means the target system is close to its performance limit. Test Health Performance Alerts highlight test or script related issues. These issues can either skew your performance test results or make analysis harder. You can often quickly resolve these issues through changes in your test script. Insights detects more than 3 different domains in a test. Typically caused by your test script containing requests to 3rd party resources such as CDNs, social media scripts, analytic tools, etc. That should usually be avoided. Insights detects more than 500 unique URLs in your test results. Commonly caused by a URL that contains a query parameter that is unique per iteration, e.g. tokens, session IDs, etc. Use the URL grouping feature in k6. Over utilization of the load generator CPU can skew your test results, producing data that varies unpredictably from test to test. High memory utilization in a load test can result in unexpected behavior or failures. It may also cause high CPU utilization (see above). No matter where you run your performance tests, Insights can receive and store your test results in one place for team-wide collaboration and analysis. Easily organize your tests into projects with role-based access control for your team members. 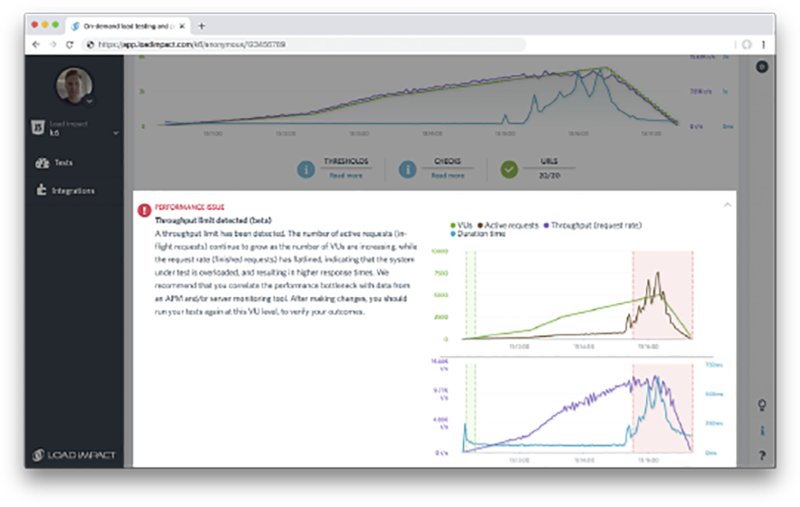 With LoadImpact Insights performance trending, see how your system's performance is changing over time, across multiple test runs. You have access to all your k6 test metrics in Insights, including URL and group response times, global and per-URL request rates, data sent and received as well as any custom metrics that you've defined in your test script. All metrics can be filtered based on tags that you have defined in your scripts. You can even tag individual requests or custom metric samples and retrieve those through Insights' powerful tag filtering. Start a test and get notified via Slack, HipChat or a Webhook when it's done. If you have also set up thresholds, the notification will tell you whether the test passed or failed. Start your free trial of LoadImpact today!